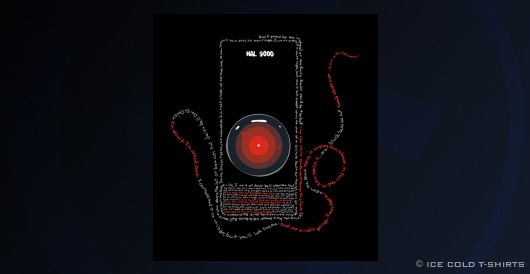 We've created another rare swag item to portray a Kubrick character who we all love to quote, HAL 9000, the artificial intelligence without whom Stanley Kubrick's 2001: A Space Odyssey, would not be what it is. Some see him as a villain, whereas we see him as a beautiful neural network whose mental wiring just wasn't built to sustain lies. As such, HAL's descent into insanity is what this shirt is all about. Memorable symptomatic quotes of HAL's demise, mangled amidst the lines of Daisy Bell, fading into blackness, is our memory of HAL 9000.